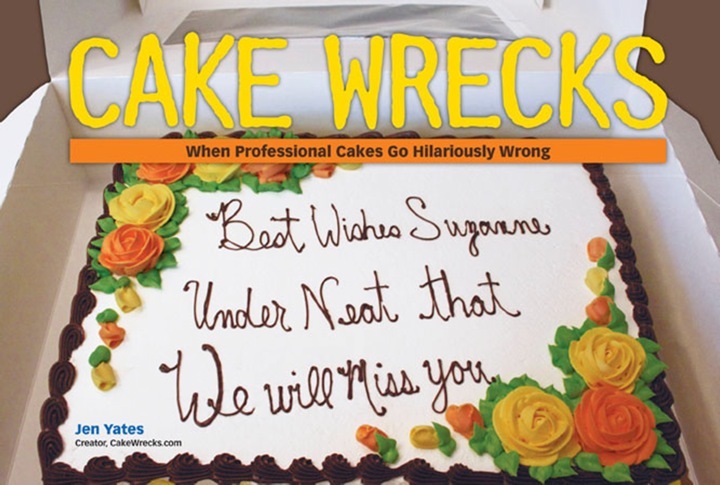 Cake Wrecks - Home - Sunday Sweets: Be My Valentine? Sunday Sweets: Be My Valentine? Check it out. This one says, "I'm wild about you, Valentine!" I think it's also saying "Eat me!" - but in a really polite way. Remember that time we released a single balloon at the park, and stood together watching it rise and rise as it drifted off into the rich red sea of the sunset? But I like to think it'd still make you smile. Boxes of chocolates are sweet, but you know what's even sweeter? Boxes of chocolates that let you EAT THE BOX. And from now on I've giving every box lid a test nibble, just for you. Well, and not choke on it, I mean. That is, it's supposed to be eaten. Wowza. Can you imagine if ALL lace was edible? That is some serious swag. And this makes my technicolor heart oh-so happy. Speaking of which, you know I have to give you a Valentine that reflects my geeky side, too, right? Just try not to read too much into the red-shirt thing. I call these, "Love Bytes." Have a great Valentines this week, Valentines! The red shirt is clearly next generation command, considering the four pips and all. Wait, that's a Captain's shirt with Spock's vulcan greeting? Cute but so wrong! Hilarious caption for the Companion Cube! The fact that there are Portal-based cakes in general is a huge win. I want that lace cake NOW! Gimmegimmegimmegimmegimme!!! That Star Trek cake is excellent. But I coudn't eat it without thinking of that dream episode where Worf was eating that cake with Deanna Troi's head on it. Want! Trouble is, which one?? LOVE the rainbow heart, but .... Snoopy! And Trek!!! Gawrsh! I just dunno; maybe I'll just tell the DH to get me one of each? Y'know the problem with these cakes? They make the wrecks look even wreckier than they were to begin with. "And from now on I've giving every box lid a test nibble,"
I want that reainbow heart cake sooooo bad. I'm so glad there are photos of how it was made on the site it came from! The problem with comparing your sweet hart to a companion cube is that you are implying that eventually you are going to toss them into a pit of flames to open a door. February 12, 2012 | Lizzie T.
All these cakes are excellent! Love the rainbow heart one. Bakingdom is a wonderful site. Thanks for sharing! Was that a 'while you were sleeping' reference there at the top?! I hope so, it's my favorite rom-com of all time. Squeeing my way down the blog post. Look, look, look! How preeetttyy! Simply sublime to just jaw-dropping. The cupcake cake! The Snoopy! The balloon and sugar hearts and rainbow hearts and robot cookies and...and... Oh, my geek heart just quietly sighed over the Star Trek cake. Happy Valentine's Day to me (and you). Happy Valentine's Day to you (and me). Happy Valentine's... Happy Valentine's... Haaapppy Valentine's too-oooo meeee (and you). Love the weighted companion cubes. The cake was never a lie, anyway, right? Sure, the mysterious person who came before never saw it, but we did. You had me at the Star Trek cake. And the companion cube. *melt* May your Valentines be Geeky and sweet (but not too sweet, 'cause cavities). You have to remember that by the time ST:TNG came around, red was the color for command, and gold was the color for security, so it was the gold shirts who were always running the risk of getting phasered. Like Tasha Yar . . .
Not sure which one makes me swoon the most -- that utterly understated single red balloon (where are the other 98?) or the perfectly ombrée sugar hearts. The box-of-chocolates and the lace just officially blew my mind. Wow. Wow. WOW. My Princess daughter saw today's Sunday Sweets and has declared that she does not want a Disney Princess party for the third year, but instead she wants a Star Trek party, and she wants me to make the featured Star Trek cake. She has been watching Season 1 on Star Trek TNG this fall (one episode a week). Thank you! My love for the last cake isn't a lie, either. Portal reference FTW. DPL beat me to the Deana Troi cake reference. It was a cellular peptide cake. With mint frosting. I gasped when I saw the single balloon cake. Absolute perfection. does anyone know how that rainbow cake was done? I'd love to try to recreate it but can't, for the life of me, figure out how that was done. COMPANION CUUUUUBE! D'awww... soo cuuute. Thanks for the link for EDIBLE LACE - if anything could entice me to want to make anything the kitchen, this might be it. I disagree with the zebra stripes, but then, I am not into animal themes. And the red/black/white thing doesn't do well for me. I will gape in awe at the EDIBLE lace. What the heck is that stuff made from? And those candy hearts? Heavens...wow. Red Shirt thing is only for the original. Red in TNG is a good thing. Some of them are WRECKS!!!! The companion cube was my favorite! Well played, well played, indeed! Love, love, LOVE them ALL! Especially love Snoopy, the ombre hearts, the single red heart, the cherry cupcake...ALL of them! It doesn't matter whether it's ST : TOS or ST : TNG. "Live Long and Prosper" along with a red shirt still strikes me as an oxymoron. How can that love not be doomed? Did anyone else see that Snoopy changed his name to Snoppy? LOL. A great way to cheer up a bed ridden gal! Had to try out the ombre sugar right away! I'm in love with the technique. I plan on making this for several upcoming holidays in various colors and shapes. First up, polka dot pink cupcakes for valentines! I noticed the "Snoppy" error as well, but I thought maybe my wreck filled eyes were just playing tricks on me. Cool round up - Naomi's cake is perfection and I have adored those Robot cookies since the first time I ever saw them. Love the star trek cake......it would make a perfect "Engage" ment cake.